VISA in collaboration with Roubini ThoughLab, a New York based research firm published an intriguing report on Cashless Cities & respective benefits of Digital Payment. Indian cities (Bangalore & Delhi) were found to have moderate adoption readiness for Digital payments whereas (Mumbai) showed low digital payment usage. In recognition of this opportunity, a number of cities globally have introduced smart city initiatives, and are utilizing a wide range of digital technologies to improve the lives of their residents. Smart city initiatives and supporting policies could potentially become critical pathways for governments seeking to foster economic growth, improve safety, attract businesses and provide better services to their citizens. Digital payments technology is a crucial enabler of smart cities, and could contribute significant benefits to consumers, businesses, governments and economies. Since digital payments are a means to an end, the scale of benefit they bring has not been broadly understood or studied. The report highlighted the net benefits associated with adopting digital payments and does so at the citylevel. The assessment was carried out for 100 cities across 80 countries, segmented by stage of digital maturity, with these cities modelled to an “achievable cashless scenario”.This scenario is defined as the entire population moving to digital payment usage equal to the top 10% of the users in that city today. The findings provide compelling support for greater adoption of digital payments. 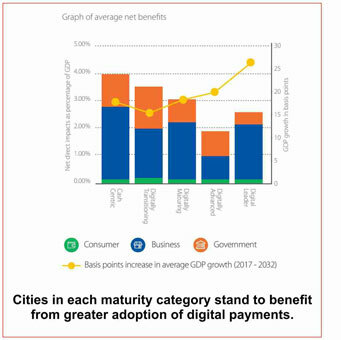 The report estimates that increasing digital payments across the 100 cities could result in total direct net benefits of US$470 billion per year. On average, these net benefits represent slightly over 3% of a city’s current GDP. Consumers across the 100 cities currently spend an average of 32 hours a year on cash-related payment activities. Greater adoption of digital payments is estimated to reduce this figure to 24 hours a year, saving consumers in the 100 cities an average of over $126 million per year.Digital payments usage, the report projects that total net benefits to businesses across all 100 cities could amount to over $312 billion per year after transitioning to an achievable level of cashless activity. The report provides support that cities cannot reach their full potential without also having a robust digital payment system. Digital payments, and the policy and industry measures that support them, mean urban consumers spend less time waiting in banking, transit and retail lines, make fewer trips to expensive check-cashing venues, and experience lower overall fees associated with financial transactions. A city’s businesses benefit when going cashless from not just greater labor efficiencies and lower direct costs, but also from increased revenue. This report further bolsters the importance of adopting Digital Payments and the significant impacts that they will have on the economic & societal growth of countries. Previous articleV.G.Siddhartha : A lot can happen over coffee!